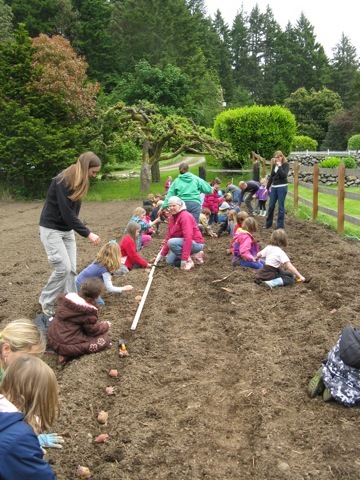 Locally grown history was made in the south end of Bainbridge Island in Spring 2011 when our third edible education program was seeded with Blakely Elementary School and Heyday Farm, on MacDonald Avenue. Through the generosity of Ty Cramer and Steve Romein, and support from farmers Craig and Alice Skipton, former pasture land at Heyday Farm has been transformed into an edible education plot within walking distance of Blakely School. Heyday Farm was started by Steve Romein, Ty Cramer, and Craig and Alice Skipton. They are reclaiming the historic Winney Farm, where Nellie Winney used to welcome class visits from MacDonald School in the 1950’s. Today, Heyday Farm raise chickens for poultry and eggs, pigs, cattle and vegetables which they sell through a CSA and other means. 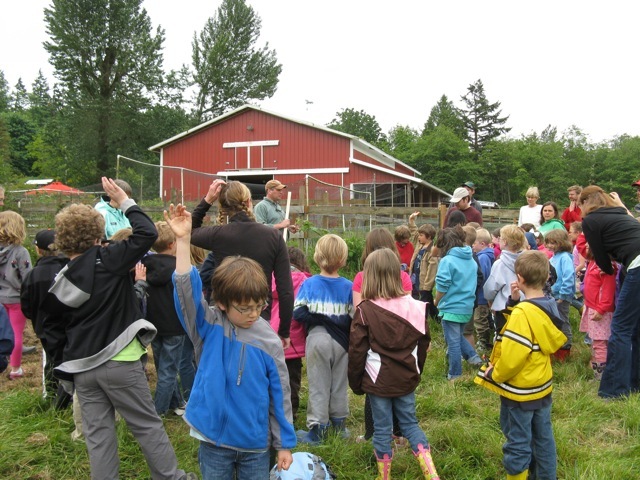 Students from Blakely Elementary participating in our Edible Education programs visit Heyday Farm, where they engage in field studies about plant and animal life cycles. In Spring 2011, the Blakely School community planted 600 potatoes seeds and more that 50 pumpkins plants, which were tended to this summer by volunteer work parties totaling more than 80 students, teachers and parents this summer. In Fall 2011, 11 classes of Blakely students returned to harvest hundreds of pounds of locally grown-student sown potatoes which went back to classrooms, homes and were donated to the school lunch programs and featured as a Bite of Bainbridge in the school lunch program. On November 11, 150 pounds of those potatoes were served in in a soup to more than 1100 students across the district. What makes this Bite of Bainbridge special is these potatoes were grown through a bunch of “firsts” with our new edible ed program in the south end of Bainbridge in partnership with Blakely School and Heyday Farm- a first season of this farm-school program, a first farm partnership for Blakely School, a first educational venture for this new farm, and the first time row crops had been planted on this fertile ground.